The annual Core BBQ took place yesterday, September 24, on the BU Beach. Current Core scholars, alumni, and their guests gathered for food, fun, and conversation. This year we played Core-hole, raffled movie tickets and lunch with Prof. Hamill, and ate a whole lot of pie. Be sure to look out for pictures from the event on the Core Facebook page (and check out the Core Snapchat (@corecurriculum) for pictures straight from the event)! Professor Daniel Bluestone of the History of Art and Architecture department takes to BU Today to discuss a topic that has been on the minds of many Americans as of late: whether Confederate monuments should stand or be toppled. Prof. Bluestone gives some context for Confederate statuary in Charlottesville and admits that he believed that counter-monuments–statues of W.E.B. Du Bois, he suggests–should be erected alongside the old, controversial works; in recent weeks, he has revised his opinion. 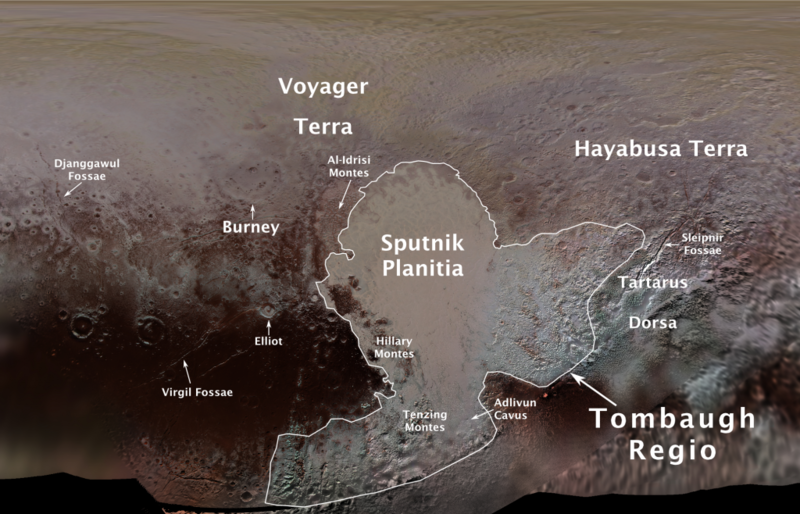 Tourist destinations of Pluto. Image: NASA/Johns Hopkins University Applied Physics Laboratory/SwRI/Ross Beyer. What if Shakespeare wrote Star Wars? (And please, do not compare George Lucas to Shakespeare. (Counterarguments will be accepted in essay format, to be submitted to the Core Journal.)) Fiction writer Ian Doescher imagines Episode VII as a Shakespearean play in The Force Doth Awaken: William Shakespeare’s Star Wars, imparting to us such lines as “E’en with th’Resistance shall my path be join’d, / Knit closely unto them as skin to bone?” An excerpt is available here. Robert Burns, a 70-year-old artist from England, has painted Jeremy Corbyn, Labour Party leader, as Christ in imitation of Renaissance painter Antonello de Messina’s Salvator Mundi (Savior of the World). (“Maybe Ive overdone the eyes a little but the picture I was working from was very startling like that.”) What interests us more is that this man also painted the ceilings of his council house with scenes from the Sistine Chapel. Suddenly feeling extremely ashamed of my apartment decor. Photograph: Graeme Robertson for the Guardian. That’s all, folks! Keep up with your reading, and remember to visit next Saturday for another installment of links.